Putney Painter and flower-painter extraordinaire, Kathy Anderson, will return with the much awaited flowers of our Vermont summers! Kathy would like to focus her emphasis in this workshop on strong block-ins and how to paint the transparency of flowers. In the home of the Putney Painters here at the Village Arts of Putney barn, she will provide a demo each morning and students will paint from fresh flowers in the afternoons. Weather permitting there may be one plein air day painting in the garden. 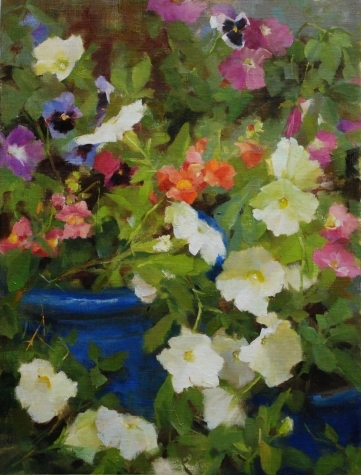 Kathy Anderson, OPA signature member, is a nationally known, award winning artist, who has been a member of the Putney Painters with Richard Schmid and Nancy Guzik since 2000. She is an artist member of the Salmagundi Club, NY, and the National Arts Club, where she has a painting in their permanent collection. She is represented nationwide by some of the top galleries, and is much sought after as a guest artist in many prestigious national shows.